Dealing with an angry person; especially, when they are larger than you and yelling, can be intimidating. Also, to approach the angry person requires courage and readiness to act. This week, we learned strategies in dealing with these types of people, fundamental lesson 10, pre fight strategy. In everyday life, the most crazy things can set people off, ” You parked in my parking space!! !”, ” Why are you looking at my girlfriend?? ?”, ” You cut me off *&(&@!$%!! Sometime you have to protect someone, your kids, and have to approach the angry person. The goal of the pre fight would be to position yourself in the most advantageous position for self defense. Legally, it is important not touch the angry person. Touching a stranger without justification could put the blame on you if a fight occurs. Don’t make a fist, this may justify an attack on you. An angry person’s insults doesn’t give you a right to attack; however, if they use death threats maybe you have a right to defend. If police show up, a fight could become a court case. It’s okay to tell the angry person, ” I don’t want to fight.” just to cover yourself in front of others, witnesses. Does this angry person have a concealed weapon? This angry person could have a gun or a knife. The Stand Your Ground, Travyon Verses Zimmerman case should have been a gun debate. No gun, no dead Trayvon Martin. Steps. Go and talk to the angry person. Make eye contact. Stay calm. Speak clearly what you want. Don’t use any insults. Always, the hands are up as if your praying but open and palms facing the opponent. The distance should be around two feet away. Be prepared to block the right or left hook. Be prepared to act. This week, actually, a week before, a white belt wanted to review a knife disarming technique during the review part of class. The owners have been debating adding in weapons disarming techniques into the fundamental classes. My practice partner was overly enthusiastic to practice the new technique. Personally, I thought practicing knife disarming technique at white belt level a bad idea but I went along with it. I know in order to disarm someone with a weapon, it takes a lot of training. My first reaction to a knife attacker would be to flee. I think that trying to disarm someone without a good reason is dangerous. Anyways, I wanted to test him. I put the pretend knife in my hand and approached with a downward motion. He weakly grabbed the downward hacking wrist and then did a terrible kimura grip. On the second attempt, I was going to pretend more like a knife attacker. With the knife, I came at him. He weakly grabbed my wrist, I immediately escaped the grip, and I pretend to stabbed him in the back five times. Right afterwards, I asked him what he excepted would really happen? He didn’t answer. He appeared to realize the reality of the situation, in truth, a mistake could be fatal. As I was reviewing advanced moves with a four striped white belt, he told me that he learned a new throw, without any thought, quick speed, and to my complete surprise, I was fully in the air and then crashing on to the mat. As taught, I slapped the mat at the right time. Got up and moved on to another technique. Getting a good throw feels good, but getting thrown hard and getting up uninjured was a thrill. This week, in the advanced class, I let myself get thrown five times so as to practice break fall techniques. Disclaimer, I don’t recommend anyone to be thrown without FULLY knowing how to break a fall. New students should be tested before taking the throwing class. An instructor should make a new student before class show them a standing side fall, forward, and back break fall. October 1, 2013, at the Newport Beachside Hotel in Sunny Isles Beach, Florida, 300 plus jiu jitsu students in white komonos celebrated the 100th birthday of Grand Master Helio Gracie. Sadly, as many know, Grand Master Helio Gracie passed away in 2009; however, the memory of Helio, his teachings, and practice of Jiu Jitsu lives on. The birthday celebration began with awards presented by the City of North Miami Beach which proclaimed October 1st as Helio Gracie Day. 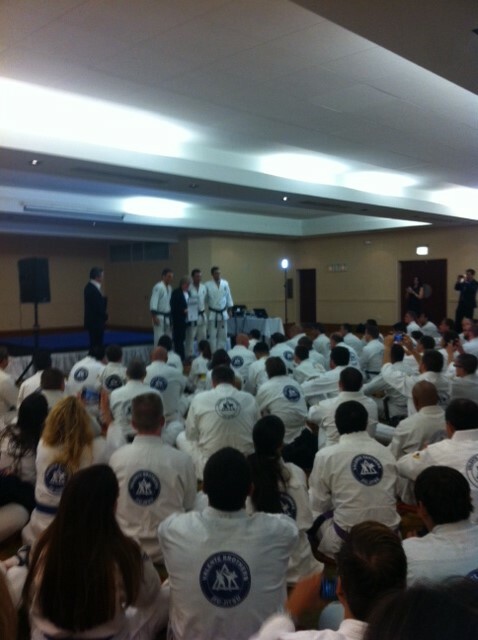 There was another award, presented by a state congressman, a purple belt. All in all, very good propaganda for jiu jitsu and good representation in government. 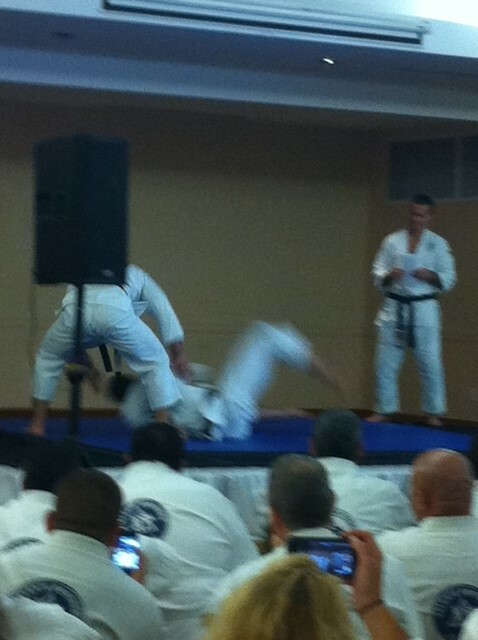 Right after the awards was held a special event, the Helio Gracie Challenge, a self-defense techniques contest. This special event featured five contestants whom were the winners from previous years. In the end, Roberto Flesishmann won. Pedro Valente gave an excellent speech on Helio’s ring fights from 1932 to 1936. Ten fights from the best fighters from the United States, Japan, and Poland. Impressive was Helio’s tremendous courage to fight incredible opponents. In post fight interviews with Helio’s opponents, they praised his superior defense. After the speech was a video presentation by the Valente Brothers, Pedro, Gui, and Joaqium. In the video, they told stories of their experiences with Helio at his home and on the mats. Finally, a slide presentation of Helio’s amazing life. The presentation ended with the last time he was seen alive by Pedro. In his door step, smiling. a hand wave of good-bye.